This week I came across a memorial service called Living Headstones. This company is trying to transform cemetery headstones to incorporate today’s technologies. They state that headstones haven’t changed in 5000 years and they offer internet connected memorials to create an innovative approach to memorialization. What they’ve created is an added value service to their existing headstones. They add QR codes to them that take users to memorial websites they create. The archive websites contains “information you and friends add about your loved one, such as: an obituary, family heritage and history, photos, comments by friends and relatives and even links to share content on popular social sites such as Facebook or Twitter.” The cost for this service is $75 in addition to the headstone. Lifestreams are becoming interactive digital diaries of our lives. While we still have a ways to go for this to become a reality, I see it coming. I can envision a future where I’m reminiscing about my past, going through my Lifestream and re-living old memories. You could locate notable dates in history to see what you were doing & what was on your mind. After we have passed, our great great grandchildren could get a much better understanding of who we were by navigating our historical Lifestream. I can see amazing future applications where you navigate a digital family tree and can drill down on individuals and then start navigating through their Lifestream. This still holds true to me and I see memorial services being created around the data we generate. I recently wrote two posts for The Next Web around this area. Social data covers the more public aspects of our lives. One way to supplement that data is by using a Smart Journal. Several services are starting to also be created or add features with fun ways to review our old data which I wrote about as well. Earlier today I saw this Gizmodo post asking users whether they backup their social media accounts. Some comments clearly show how I believe many people consider what they post on social sites to be disposable data. I don’t think most people are taking into consideration how they can use tools available to them to create digital journals for future generations. Hopefully this will change and I’ve dedicated a section on this site to provide information on tools and methods to do this. Interestingly enough, today I also saw a post by Kevin Kelly about how he created a memorial book for his father Joe Kelly last year. 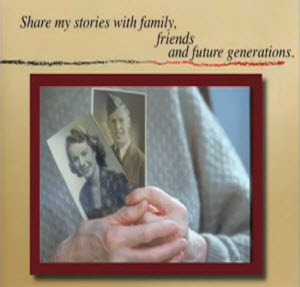 All of the children and grandchildren contributed old photos and remembrances from his life. They then used Blurb to print out copies to pass out at the memorial as the perfect memento. I’m sure we will continue to see new and creative ways to create memorials using today’s technology. Mark,I really enjoyed this post. I stumbled upon it by accident but I truly look forward to searching through your posts. I’m interested in pursuing the subject of “lifestreaming” further in my own life. Thanks for your input! Thanks Bonnie, I appreciate the kind words and hopefully you find more resources here. In this modern era such kind of technology is available those remember you the past memory. I hope every people are like this memory and they enjoy this so more with technology.